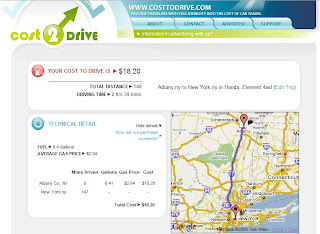 Cost To Drive is an interesting site that calculates how much you driving from one plce to another one. I do not know how does it do it but it is interesting, if you want drive to somewhere it is simple to fill addresses, then it will figure out how much it cost. You need tell it what car you will use, brand, model. After a while it will tell you a result that included miles, gallons, gas price, and how much it cost. It also shows you a google map, about distance, and total time. I filled distance that from New York City to Albany, it had show me that costs $18.20. I use Honda Element, spent 6.41 gallons gas, one gallon gas costs $2.84. It is good to use it to compare different cars. For example, A trip from New York to Los Angeles costs $678 in a Hummer H3 and $219 in a Toyota Prius.